Institute of Chartered Accountants of India (ICAI) will keep records of attestations by CAs. As per the latest ICAI notification, ICAI has launched new system to generate a new unique identification Number to keep track and records of attestations and certifications done by CAs. This will help the Institute to track all the certifications and also make fake certifications / third part certifications harder to get. This action has been taken after recent certifications in case of PNB Scam and other scams which has come under the light recently. What is Unique Document Identification Number(UDIN)? 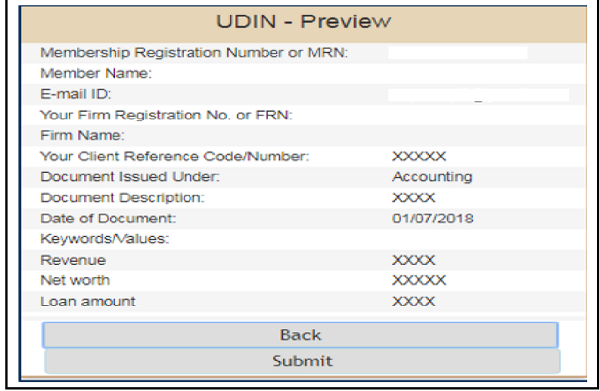 Unique Document Identification Number (UDIN) is a unique number, which will be generated by the system for every document certified/ attested by a Chartered Accountant and registered with the UDIN portal available at https://udin.icai.org/. What is the Algorithm of UDIN? The Membership Number of the Member attesting the document/certificate. The Date (dd/mm/yy) when certificate is issued. 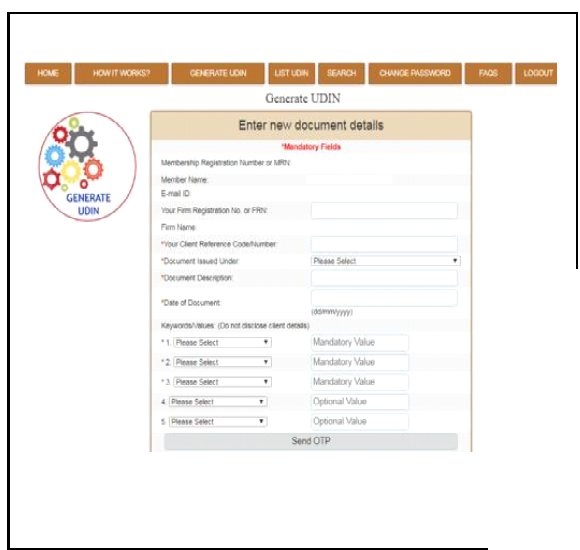 The Document Serial Number allotted automatically by system. It has been noticed that financial statements and documents were being certified/ attested by third persons, in lieu of Chartered Accountants. As these statements are being relied upon by the authorities as true statements and certificates, UDIN can be generated by a practicing CA by registering his/her documents/ certificates on UDIN Portal for verification. A practicing Chartered Accountant can generate a UDIN for certificate/ document attested by him either in an individual capacity or as a partner. Whether UDIN is mandatory for the CA members of ICAI for each certification done? At present, this facility is recommendatory. But ICAI is mulling to make the same compulsory in near future, so as to curb the menace of fake or forged documents. What is the link to crosscheck whether the certificate number so indicated is valid? Also, under the new system any person can the check the validity of the certificate issued. How many UDINs can be generated by a CA? Is there any limit? There is no restriction on the number of UDINs to be generated by a CA. Can a Certificate number once generated be revoked or cancelled? The UDIN once generated can be withdrawn or cancelled with narration. Hence if any user search for this UDIN, appropriate narration indicated by Member with the date of revoke will be displayed for reference. What is the validity of a UDIN on the portal for viewing by a third party? As of now, there is no time limit. Is UDIN mandatorily required to be registered for the search? Yes, UDIN will be available for search by the end user only after registration. What are the key values and are they necessary? 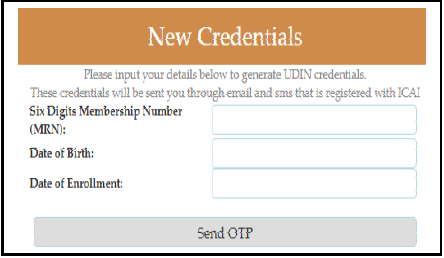 While registering the certificate for generation of UDIN, the member has to compulsorily provide Key values (minimum three and maximum five), which are found in the document or certificate generated. Key values can be any financial figure extracted from the attested statement or certificate such as Turnover Net profit, Utilization amount, Import amount, Export amount, Duty refund, Refund, Net worth, Revenue, Input tax credit, Loan amount, Total Assets, Net owned funds, Profitability, Capital To Risk Asset Ratio (CRAR), Statutory Liquidity Ratio, Gross fixed assets, Net loss, Misc. expenditure, Total capital investment, Sanction amount, Other (please specify any key words),etc. 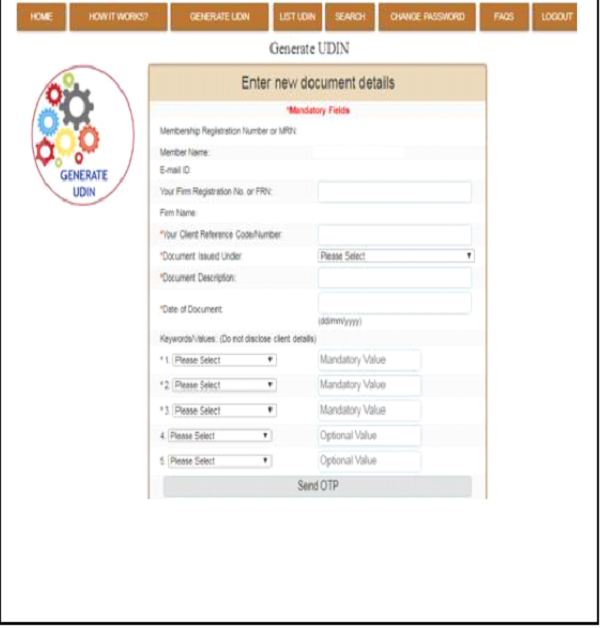 Is online generation of UID number is mandatory? Or, if the UID number is generated offline, can the same be entered in backdate? Yes, it is mandatory that the numbers to be generated online only. How will the UDIN appear on the documents? UDIN that have been generated would be displayed as watermarked on document(s) else the UDIN can be mentioned on the document(s)using a pen.“List UDIN’ menu can be used to print the UDIN. Can UDIN be generated as per the category of the area of certificate? Yes, UDIN can be generated in the specific area of certificate, like Goods & Service Tax Act, banks, Companies Act, Income-tax Act, finance and capital market, public finance and government accounting, etc,. 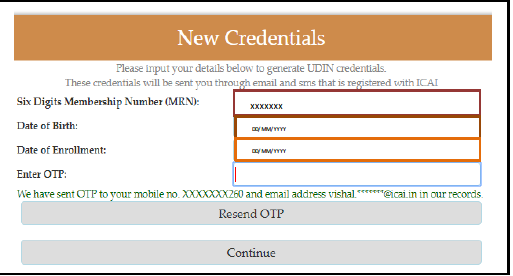 How to create an account on the UDIN portal? An OTP will be sent to you at the mobile and email, as registered with the ICAI. 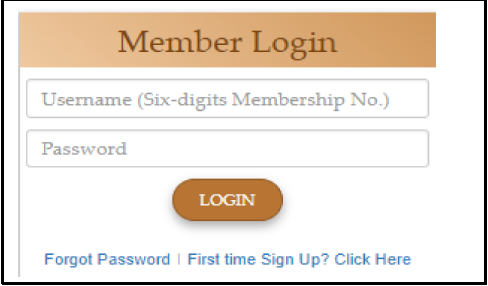 Step 4: Enter OTP received and click “Continue”, you will receive username and system generated password at the mobile and email, as registered with the ICAI. Should the password be changed after login for safety? The password generated is encrypted to ensure its appropriate safety. However, Members may change the password at any time. “Change Password” menu can be used to change the password. Under “Sign-in”, select “Change Password” menu. Enter your new password, then click send OTP. You will receive an OTP rget pa sword? on your mobile and email, as registered with the ICAI. ” Enter details such as, your Client Reference Code/Number, Document Issued, Document Description, Date of Document, Keywords/Values (minimum three) with in the document and click the button “Send OTP”. Firm Registration Number (F RN) is Optional. ” An OTP will be sent to you at the mobile and email, as registered with the ICAI. ” Enter OTP received and click the button “Preview”. You will see the details you have entered for generating the UDIN. UDIN that have been generated would be displayed as watermarked on document(s) else the UDIN can be mentioned on the document(s) using a pen. “List UDIN” menu can be used to print the UDIN.